We have a new challenge over @ 613 Avenue Create & our theme this week is to make your creations with sights/sounds/smells/tastes of Spring in mind. One of our awesome sponsors is The Paper Shelter & they generously gave each of us an image to play with-THANK YOU!!!! I used Everyone Can Fly to make my Spring inspired card & I didn't add flowers this time....I know--SHOCKING LOL!!!!! For more inspiration, check out our blog to see what my teammates created & while you're there; read up on our rules so you can play along with us!!! I can't wait to see what you all come up with.....have fun & happy stamping everyone!!! This is super cute. I like the way you did your banner with the flowers and I love that little charm! I love all the winged critters Jackie! The vellum butterfly wings and the unique pennants are really nice details. Love how you did her red hair too- nicely done! What a cute image great colours & layout. great card Jackie! the image is really cute and I really like the soft peach and black colour combination you've used! great layout too! Thank you for joining us in our Spring Time challenge this week at Crafty Catz ! This is just simply adorable! Love all the colors. So cute! I love that sweet image! Thanks for joining us at Doodle Pantry Digital Doodles Challenge! 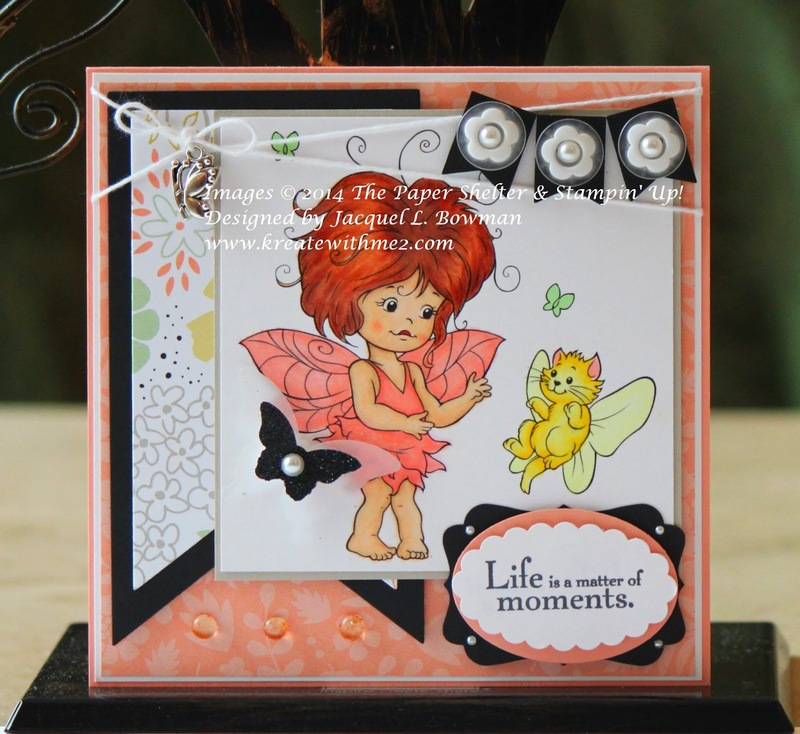 Fabulous card,love the sweet image and your colouring of her! Love the banner too! Thanks for joining us at The Doodle Pantry Digital Challenge #45! Beautiful card! Love the great layout and the fabulous details you have used on this. Thanks for joining our monthly challenge here at Doodle Pantry challenge. Hope you will join us next time DT Crafting Vicky. Another awesome card Jackie, I love coming here. Your coloring is awesome. Great image and nice paper too, I just got this, can't wait to use it. Way to go! Thanks for playing our challenge at 4 Crafty Chicks! Love her vibrant red hair, I love red hair, ever since I was a child I wanted red hair and freckles, lol! And I just realized I've never even colored red hair, looked through my collection of Promarkers and realized there is missing some colors for that. So new items on my ever growing wish list! Hi Jackie, this is really sweet, love the color of her hair. Thanks for sharing with us at CFAS, and good luck. This is so cute, and great color choices. Thanks for joining us this week for our "123 Recipe Challenge." Come back and join us again. Good Luck. A lovely and adorable card. You have made an awesome spring creation, perfect for our challenge at Crafty Catz. Thank you so much for joining us and don't forget to check the next challenge starting today. This is great. Live the whole layout. Thanks for joining us at CMM. Adorable card Jackie! Thanks so much for joining us for Doodle Pantry Digital Challenge 45. Thanks for joining us at RRR.